The last time I messed around with a 3D incarnation of one of THE arcade classics, I wasn’t entirely thrilled. Now I’ve taken a look at what I suppose I could call “the other end of the spectrum.” Asteroid 2012 3D certainly does a number of things well, but it’s not perfect. Thankfully, it does “well” well enough that it’s still pretty fun. 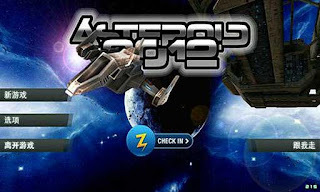 Asteroid 2012 3D is an arcade space shooter through and through. One that makes no effort to hide its roots and makes no apologies for doing so. Or refusing to do so, rather. Players assume control of a space ship, then fly around blasting asteroids and the occasional enemy fighter while earning a power-up or two along the way. Steering is handled with the accelerometer, while everything else (shooting, acceleration, bombs, etc…) use virtual buttons. Now I’m usually hesitant about accelerometer controls, mostly because they often fail horribly, but Asteroid 2012 3D manages to pull them off fairly well. Being able to recalibrate from the pause menu helps a lot, I’m sure, but the controls fall somewhere in that middle-ground between too-sensitive and unresponsive. Which is a good thing. I also have to admit I found myself almost stuck in a rock-blasting loop. It’s always “one more wave.” The game also looks fairly pretty. I wouldn’t consider it one of those games people show to their friend and laugh while their jaw unhinges like a python’s, but it’s certainly far from ugly. As entertaining and functional as Asteroid 2012 3D can be, it’s still pretty bare-bones. Aside from earning power-ups and shooting stuff, there’s no real sense of progression. Waves get tougher, sure, but it’s hard not to be disappointed by the lack of unlockables or upgrades. And while the Retro Mode is nifty looking in a Holy 1970s kind of way, it amounts to little more than a visual filter. Although it does make spotting hostile ships much easier. I also didn’t find the radar particularly helpful (seriously, how do I read that thing? ), but it never really got in the way of the gameplay. Whether or not someone enjoys Asteroid 2012 3D depends on how fond the are of the 1979 arcade original and how much fun they have with totally mindless action. I’d never attempt to call it a “deep” experience, but sometimes I don’t want deep. Sometimes I just want to blow crap up. And I can think of worse outlets than this.